Here are a few random tidbits for this week. So, I have decided to take Tuesdays off from the blog world. It's a four post week for me from now on. I started to feel overwhelmed with posting five days a week and I never want this blog to feel like a chore. Once it stops being fun or feels like I HAVE to post something means that it's time for me to quit and I DO NOT want to quit. I finished my Halloween costume yesterday and I definitely bit off more than I could chew this year. I haven't made a costume in years and forgot how Type A I am when it comes to DIY projects. I think that is why I never usually attempt them. It's like I can't stop and end up spending six hours on something that should have only taken me a two. I can't wait to reveal it to you. I think I am more excited about what Ross is wearing. I still can't believe he agreed to it! I downloaded the new Taylor Swift album, Red. Every song is about love, being young or being young and in love. Shocker. I know. It's what we expect from the love/relationship obsessed Miss Swift, BUT I still love it. Out of fifteen songs, there are only two that I don't care for. My two favorites are collaborations she did with other male artists. If you are any type of fan of hers, you should definitely pick it up or download. I need some movie rental suggestions. I am in the mood to curl up on my couch this weekend for a good laugh or a good cry. I have NO CLUE what is even out right now. I am horrible with keeping up with movies. Sci-fi, horror or blood aren't really my thing. Any ideas that Ross and I would both enjoy? The last movie I saw was Katy Perry in 3D...that should tell you something. Ready. set. go. And what are your thoughts on this pattern mixing? This was my first rodeo with mixing plaid and polka dots. I must admit, it was a comfy and fun concoction. Today is the LAST day to enter the October Group Giveaway. Nine Prizes! 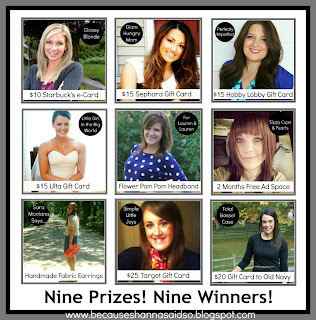 Nine Winners! Go now! This look is just super adorable! You are the epitome of a fabulous Texas girl :) Adore the boots styled with the plaid/polka dot combo! How sweet is that updo?! :) My philosophy on blog posts is it's better to have fun with interesting posts than be stressed or frustrated and publish unsatisfying material. I just bought that exact plaid top! However, that dang sweater is sold out. I missed the boat. Love the look! I think taking a day off is a fantastic idea. Love your hair up...but then again you're always adorable. Movie suggestions...Man on a Ledge, The Lucky One (mainly because Zac Efron is SMOKING hot), The Holiday (my personal fave), hmm...I can think of a lot more later. Oh...What to Expect When you're expecting. GREAT!! I really like the combo of the plaid and the polka dots. I think its not as "loud" because you have your hair up, and you're wearing dark bottoms. I feel you on the "taking a day off" thing. I'm not as consistent as I would like, but hey, its ok. SO, take Tuesdays off...we will miss you, but we know that its best for you. Good luck on the movie search. I rented Hunger Games a few weeks ago, it was ok (I read the books first, so the movie version is always a bit disappointing to me after that). i love the pattern mixing and want to copy of course! and I like the 4 days a week posting! it does get to be a lot some weeks! You look amazing! Love how you styled that polka dots sweater with a plaid shirt :D Awesome! I absolutely love this whole look! I would most definitely wear this! why are you so adorable!? you look great, i love the bun! How cute is that outfit! Love it! Love the polka dot sweater and the boots! Your hair is too cute as well. Good for you about he 4 posts a week change...I understand how the pressure to keep up can become overwhelming. Quality will win over quantity every time! Shanna, you look beautiful! I pretty much have this exact outfit, twinsies? Love it. Also, don't feel bad about only posting 4 days... I only do 3 and I even think that is a lot, haha. I meant to post my outfit post this morning with this same sweater, albeit in green, but a different post went up instead! I mixed my sweater with a stripped sweater, so I think it's safe to say I'm a fan of the pattern mixing. Help me be strong enough to go buy the polka dotted cardigan I saw at a boutique near my house. HELP ME! Love this! I never would have thought of this combo but I really, really love it. Gonna use it for some inspiration :) And another another note I love your hair like this! Love this outfit! Plaid+ polka dots is on my pattern mixing to-do list. Mike and I both really loved the Five Year Engagement. We laughed our butts off. Adorable and FUN pattern mixing! I love it! I don't blame you for cutting down to 4 posts a week...5 is a lot and is so time consuming. I can't wait to see your Halloween costume! That sweater reminds me of those little mini chocolate chip cookies cereal. Shanna, I say this every comment, I think...but why are you so dang cute? This outfit looks fabulous on you--especially your hair! And I'm glad to hear you're taking Tuesdays off from blogging. Some weeks I get crazy and post 5 days, but somehow that builds the same pressures you're talking about. When I take even just one day off, it's soooo refreshing to breathe and be grounded again in reality. Love, love, love this look! Polkadots are definitely one of my faves and I love how it looks with the plaid underneath! Oh and that necklace - too flippin' cute! I think your hair is my favorite like that! First of all, I LOVE this look--the polka dots and plaid are such a fun combo! Also, I don't blame you for changing to 4 posts a week. I try to do 5 sometimes, and it gets so overwhelming! I usually take Wednesdays off, just so I can have a bit of a "blog breather"! LOVE the polka dots and plaid. So stinkin' cute!! I really like the mix here - I may just try it myself! Just stop putting together amazing outfits. Stop it! I absolutely love this one and I think you hit the nail on the head! Can't wait to see this costume you speak of! As for movies, the new Twilight one comes out in a few weeks, so I'm planning a Twilight marathon of rewatching the other movies in the series < --- nerd alert! But I also want to go see Taken 2!! I loooove TSwift and her new album. I have it playing right now in fact! Im pretty sure that if I ever met her I would 1. die and 2. she and I would be bffs. Im just certain of it. I can't wait to see your costume! Plaid + polka dots looks amazing, and again is something I would never think to do! And, your hair is killing it. We have been on a horror movie kick lately, so I probably wouldn't be much help! I can't even think of the last "normal" movie I've watched...that's a problem! Love your polka dot sweater! I also really like how paired it with plaid. Very fun. Obsessed with that outfit! Love the pattern mixing. It looks amazing! I'm loving each and every piece! WOW, such a pattern mix in this look! Love that look! and yes, you should want to love to post. I am fine with 4 posts a week although I will moss you on tuesdays! Cute outfit! I love the pattern mix and your boots are super cool! I really need to add some polka dots to my closet! Love your sweater! love the combo! it's totally cute, and can't wait to see your guy's costumes! Saw the tulle preview.. hmm..
You rock that outfit. I love your style so much! Your layering here is perfection...love it! I obvi saw this combo on instagram, but just wanted to tell you again how cute you look! it's unexpected but I love it. also, I think it's a great idea to post less if you aren't 100% in it. take some random days off if you aren't feeling inspired - we'll appreciate the posts that come after that much more! First, I love this outfit. We need to live closer so we can share clothes! Second, I feel the same way right now with time and blogging. I have decided to do the same and only post 4 times a week. Third, Magic Mike just came out :) hehe!! I bet Ross would be thrilled with that choice! Sorry Ross! Fourth, I need to go shopping with you!! Have a great night friend! I love the polka dots and plaid together!!! I really need to get Taylor Swift's new CD. I love her! I am loving your gorgeous photo shoot locations! This sun tinged greenery so pretty! And you are amazing in polka dots + plaid... sooo meant to be paired, and you pulled it off perfectly! Good for you finding some balance in your life! Can't wait to see your Halloween costume. I just finished mine tonight ... took lost of under my breath cursing and a few beers, but it. is. finished. I love it! Polka with everything is a winner! BY FAR my fave outfit you've ever posted. LOVE IT. and girl, glad you're taking time for YOU and going to 4 days a week!! you are so smart for doing that and not burning yourself out! First of all, I love your outfits and what you're wearing in this post. :) I have the same exact Old Navy sweater (and the one in green, too). Best ever! I love this outfit!!!! You look so freaking cute. I'm really loving your hair like that too. It's so fun! That's a fabulous red plaid shirt. Love your polka dot sweater layered over the plaid... too cute! I have almost that EXACT outfit :) I have boots with a red zipper and that polka dot shirt!